I owe my blogging public chair photos and the kids' 7 month letter which will be posted this weekend. In the meantime Spring has sprung and the Nanny sent me this photo from her cell phone earlier this week. I have forwarded the crap out of it to all my friends and co-workers but just couldn't resist posting even though the quality isn't great. Apparently Nanny saved the good ones on her camera for a little surprise for Husband and me that she is still working on. Enjoy! Yes, there is fake green grass and easter eggs in the basket. The nanny tried them out in the basket the other week and Penny threw grass onto Ned's head where it stayed until they finished playing. Oh. My. Goodness. Beyond cute!! Bunnies! I saw a sign at South Shore Plaza that a new photo studio is opening up and they're going to have live bunnies to take pics with your kids. Not sure how keen I am with bunnies and the twins since I think a bunny took a nip at me when I was young. However your bunnies are simply too cute! That is ridiculously cute! 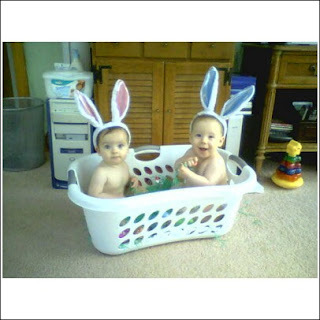 Do they have green Easter grass in the basket too? Seriously, that is the best. Oh my, that is sweet! Your nanny sounds super. Great, great pic. Super sweet is right. OMG, why did I not receive this via text? SOOOOO Cute! I love this!